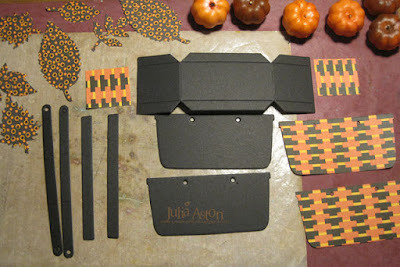 This month, Eileen Hull's Inspiration Team is making Halloween/Fall projects using her Sizzix dies. She will be gathering the projects from our individual blogs and posting them every week over at her blog during the month of September. For my project - I made a spooky little Halloween Basket full of Goblin Jack O' Lanterns and a stray skull, spider and black crow!! For my project I used several of Eileen's Sizzix Dies - Basket, Spring Leaves, and Thinlits Birds and Butterflies. I have a few creation photos to show what I used and how I put it together. 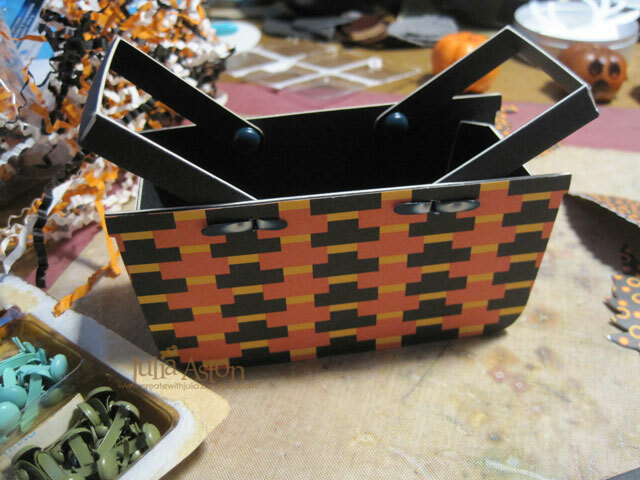 I die cut the box out of Little Sizzles Black Matboard. I die cut the Spring Leaves out of some patterned paper. I cut each of the leaves twice turning the paper over for the 2nd cuts so I could glue them together so the print showed on each side I had these little hard foam pumpkins in my stash from JoAnn's. I glued the papers to all 4 sides of the basket and then assembled it. I attached the handles with brads, putting the head of the brad on the inside. I love how this paper actually looks like a woven basket! Then I adhered the rim of the basket onto the top edge on the front and back. This covers the brad tails and makes everything look neat and tidy! 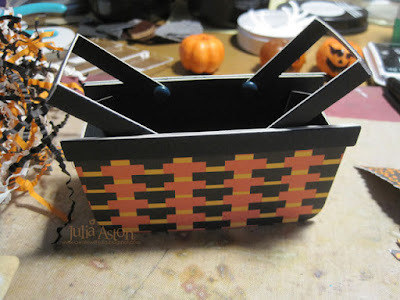 I used ScorTape on the rims and Tombow Glue on the papers and sides of the basket. 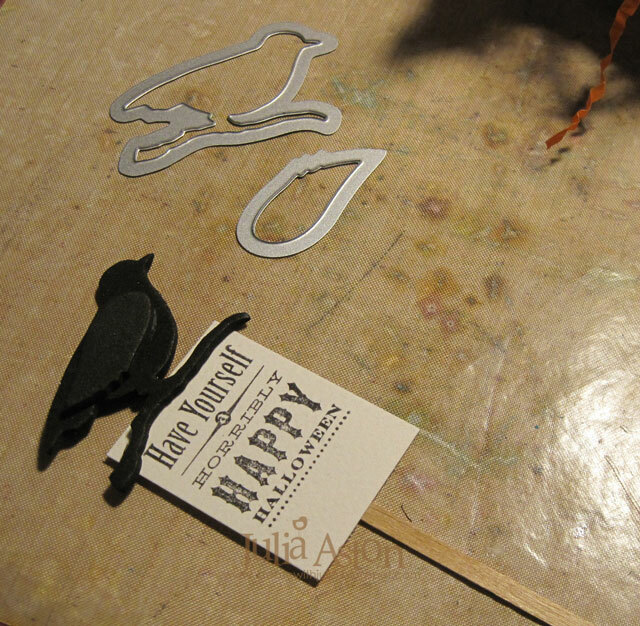 I die cut the bird out of black fun foam - running it through my die cutting machine a couple of times - it cut right through no problem. I adhered the wing to the bird, stamped the sentiment on a piece of watercolor paper and glued a wooden coffee stirrer (from Starbucks) to the back of the panel so I could just stick it into the basket. I drew scary faces on 3 little pumpkins with a black Sharpie pen and glued an Idea-ology Skull to the top of one of them. 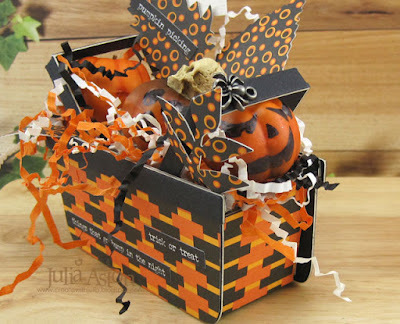 I put a handfull of Halloween Basket Shred into the basket. I adhered a spider to one of the handles. I added some Small Talk Stickers/Occasions to a leaf and the front side of the basket. 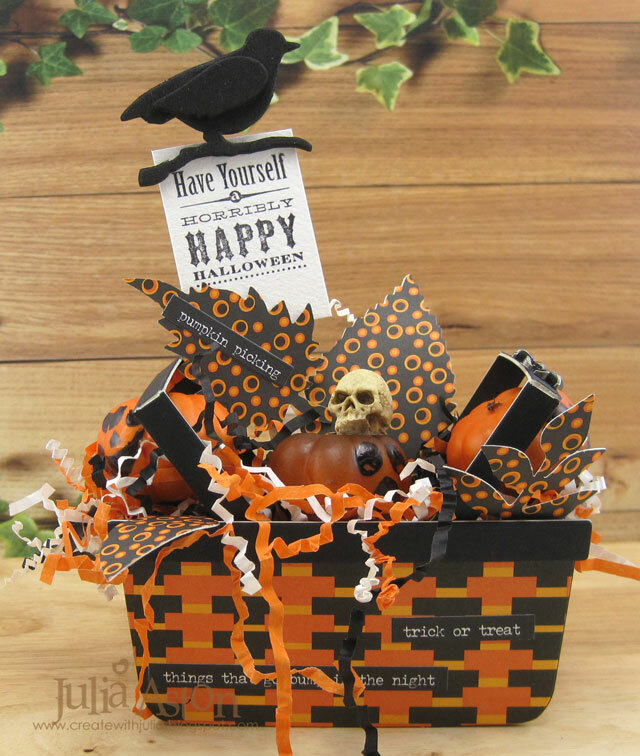 I hope I have given you some Halloween inspiration using these dies and that you will check out Eileen's Blog to see what the rest of the Inspiration Team has up their Fall sleeves this month! Paper: Black Little Sizzles Matboard - Sizzix, Arches Watercolor paper, DP Textstyle Hocus Pocus - PTI. Accessories: Basket Die, Spring Leaves Die, Sizzlits Birds and Butterflies Dies - Eileen Hull/Sizzix, Halloween Basket Grass, 1" Pumpkins - JoAnn, Small Talk StickersOccasions, Spider Adormment, Skull - Idea-ology, black Sharpie, Tombow Glue, ScorTape, wooden coffee stirrer - Starbucks. This basket is fabulous, Julia! 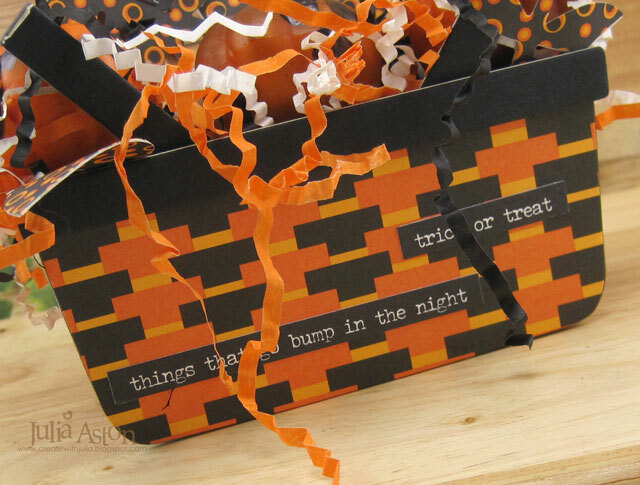 Love the orange and black weave and how perfectly those little Halloween stickers fit! What a fun way to display these creative Jack-o-lanterns! wow, this is over he top amazing...just love this. you are so talented! September Papertrey Ink Blog Hop!